Sometimes teeth that have been damaged by deep decay or become broken or infected can only be saved through specialist root canal treatment. At our clinic in Harley Street London we are experts at root canal treatment and can work deep inside your damaged teeth to return them to good health and ensure that they do the job they were designed to do. Root canal treatment is also known as endodontics. This name derives from the Greek ‘endo’, which means ‘inside’ and ‘dont’, which means tooth and sums up root canal treatment perfectly, as it is treatment inside your teeth. At 75 Harley Street our specialist endodontist is Dr Shahrzad Rahbaran who completed an MSc in Endodontics in 1999 and has extensive specialist practice experience. Root canal treatment is sometimes necessary for patients who visit our clinic at 75 Harley Street, London, because there is damage deep inside a tooth. Root canal treatment is concerned with the pulp chamber and root canals that contain your teeth’s pulp or living tissue. Our root canal treatment experts understand that this pulp, although it is often referred to as ‘nerve’, contains a fine network of tissue fibres, nerves and blood vessels. If a tooth has a large cavity that reaches the pulp chamber or if a tooth has been damaged, the pulp is left open to exposure to bacteria. It is important to ensure prompt root canal treatment because, once root canals become infected, painful abscesses often form in the jawbone. At 75 Harley Street, London we understand the importance of immediate and effective root canal treatment. Many people worry about root canal treatment so at our Harley street clinic in London we do our very best to explain why root canal treatment is necessary, the purpose of our expert intervention and any procedures that will be involved. The purpose of any root canal treatment is to remove bacteria from inside the tooth and ensure that the root canals are then carefully disinfected. Root canal treatment procedure isn’t as invasive as it sounds; a small hole is made through the damaged tooth into the pulp chamber. Once we have done this, we locate and measure the root canals and then use fine instruments called files to clean them. In addition, a cocktail of irrigants are used to chemically disinfect the inside of the root canals. Our Harley Street root canal treatment team will explain any possibility of post-procedure discomfort, which is usually negligible and very short term. At 75 Harley Street we are quick to reassure patients that root canal treatment is not painful. Our Harley Street specialists use local anaesthesia throughout the root canal treatment and we have the very latest in modern anaesthetic solutions to and a computerised injection system, all of which ensure that you will be comfortable throughout your root canal treatment visit to 75 Harley Street. If you are worried about pain or discomfort from root canal treatment either during or after your procedure, our Harley Street team will be happy to answer your questions and you can view our root canal frequently asked questions. Root canal treatment is a minor surgical procedure and must be undertaken at our clinic at 75 Harley Street, London. However, do please let us know from your first visit if you are nervous in any way about your root canal treatment. We pride ourselves in offering individual solutions for nervous patients. If, after a chat with our Harley Street team, you still have concerns, we can arrange oral or intravenous sedation. As your safety is of paramount concern, the presence of an anaesthetist is recommended whenever any such sedation is required. Because root canal treatment involves work deep inside your tooth, you will require x-rays to ensure an accurate picture of what is happening and exactly what root canal treatment is necessary. Here at 75 Harley Street we understand that some of our patients have concerns about the use of x-rays. We ensure that all of our radiographs are of minimal dose through the use of the very latest digital x-ray systems, which are capable of reducing an already small radiation dose by an impressive, further 80%. This means that patients undergoing root canal treatment at our Harley Street clinic in London can have five digital x-rays for the same dose as one traditional dental film. Each of the patients who visit 75 Harley Street has different and very individual root canal treatment requirements. 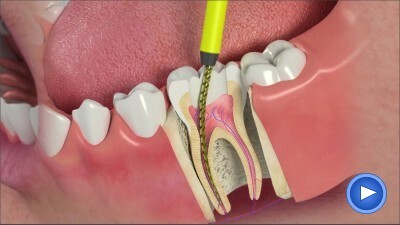 This means that the time required for root canal treatment will differ according to the complexity of the procedure. If you're interested in how much it will be, please vist our page with our standard root canal costs. Re-treatment, although rarely required, can also take longer than initial treatment. Before your root canal treatment you will be asked to visit 75 Harley Street, London for an initial consultation, this is usually a 30-minute appointment. You may also need a follow-up appointment at 75 Harley Street of one to two hours. If you have any concerns about the necessary time for root canal treatment, do please speak to our Harley Street team. For some patients it may be possible to complete treatment in one extended appointment. Root canal treatment here at 75 Harley Street, London enjoys a very high level of success. However, it is important to remember that success cannot always be guaranteed for any medical procedure. You can also read about the benefits of root canal along with the risks and complications of root canal. Our clinic here in London offers the very best treatment, equipment and magnification; however there are occasionally circumstances, out of the control of our root canal specialists, that limit healing. Should this occur we may recommend another visit to 75 Harley Street, London to eradicate the infection.